That Letter Game is almost being released for Android! 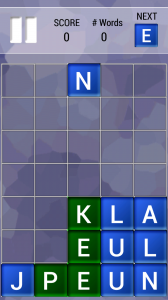 That Letter Game is a mix of Tetris and Scrabble and is highly addicting! Letter blocks fall, you decide where they go and then you make the words. Hard mode: Letter blocks fall faster for every level you gain. Normal mode: Letter blocks fall at the same speed for the whole game. We support multiple languages. At the moment these are English and Dutch (Nederlands). More will be added in the future.